The koala has been declared vulnerable under the Environment Protection and Biodiversity Conservation Act 1999 in Queensland, New South Wales and the ACT, due to a significant decline in populations across this range. The main identified threats to Koalas are loss and fragmentation of habitat, vehicle strike, disease, and dog attacks. Drought and incidences of extreme heat are also known to cause very significant mortality. The Koala is one of Australia’s most distinctive and iconic wildlife species. Male koalas are generally larger than females. In the north of Australia koalas are significantly smaller than their southern cousins with shorter silver-grey fur, whereas those south of the border have a thicker brown-grey fur which keeps them warm in the cooler winters. Koalas live in a range of temperate, sub-tropical and tropical forest, woodland and semi-arid areas dominated by various species of Eucalyptus. The Koala was once common throughout forests and woodlands extending from north Queensland to the south-eastern corner of mainland South Australia. However, Habitat loss is now the greatest threat to Koalas. The main reasons for this are land clearing, bushfires and diseases of the eucalypts, like ‘dieback' which cause the trees to die. 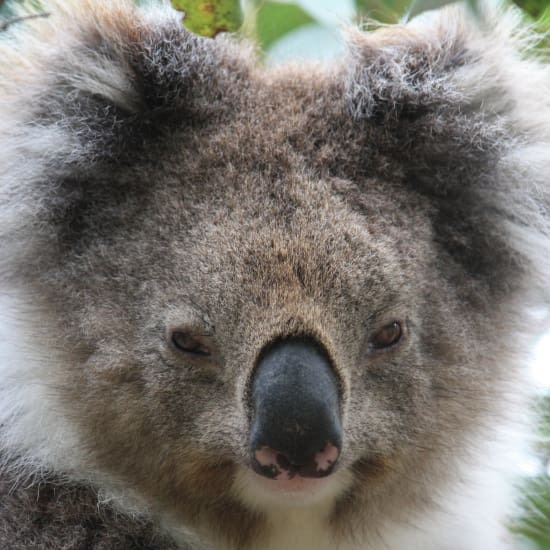 Currently koalas occur in north-eastern, central, and southeastern Queensland, eastern New South Wales as well as Victoria and south-eastern South Australia. • Koalas have two thumbs on their front paws - to help them climb, to hold onto the tree and to grip their food. • An adult koala eats about 1/2 - 1 kilogram of leaves each night. • Koalas on mainland Australia produce on average, one young every two years. • When Koalas are born, they are only 2 centimetres long, which is about as big as a jellybean! • Koalas sleep between 18-22 hours each day! Earthwatch Australia is working with leading Koala researchers to reverse the decline of koalas, through the re-establishment of koala populations in unoccupied areas of suitable habitat. Large areas of forest that once contained koalas, but which are no longer inhabited, provide an ideal opportunity to increase the distribution and abundance of koalas through strategic translocations. The project aims to advance current conservation policy, increase the distribution and abundance of koalas and highlight that well-managed agricultural landscapes can still provide valuable koala habitat. • Strengthening conservation of koala habitat. • Development plans which address ways to mitigate risk of vehicle accidents when development occurs adjacent to, or within, koala habitat.